I’m handy with a knife, never fearful nor shy about turning a whole chicken into frying parts, or chunking up a hunk of pork shoulder for carne adovada. But why should I spend my time trimming and boning meat and poultry when there are powers far greater than I willing — and able — to do the dirty work for me? I came late to this conclusion not long ago after asking the meat man at Shoreline Central Market about a specific cut of beef in his display case, one that looked like the perfect dimension for my Sri Lankan beef-curry recipe. “Would you like me to cut that for stew?” he asked. Indeed I would! And in fact he did, trimming the fat from the beef — and trimming at least 20 minutes from my kitchen prep time. 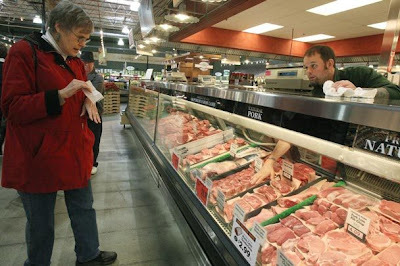 Jason Whetham, meat manager at Shoreline Central Market, assists customer Nancy Wiesner, who lives in Ravenna, but shops here regularly — thanks to the great service. [Seattle Times photo/Ken Lambert]. With all the talk lately about the rise of specialty butcher shops doing things the old-fashioned way (my hat’s off to them), I’m here to remind you that if you ask nicely, the guy (or gal) behind your supermarket meat counter is also there for you. I’m not just talking about the folks in the upscale meat departments at places like Metropolitan Market, PCC or Whole Foods, among others. When I told my tale of two chickens to Dave Bolewicki, who manages the meat department at QFC in Factoria, he provided this caveat: “We deal in retail-quality meats, not wholesale-quantity meats. When they’re on sale at 49 cents a pound, they’re a grab-and-go commodity. We’ll process one or two, but we can’t cut up a whole case of them for somebody.” That requires time and labor, he said. Echoing other meat-department managers I spoke to, Bolewicki said special orders are always welcome. “With a little heads-up, we can have things ready and waiting for pickup.” But the last thing they want to see, he said, is some restaurant chefs buying a half-dozen pre-packs of pork shoulder at 99 cents a pound and asking supermarket staff to cut the meat into steaks or otherwise “process” it for them. 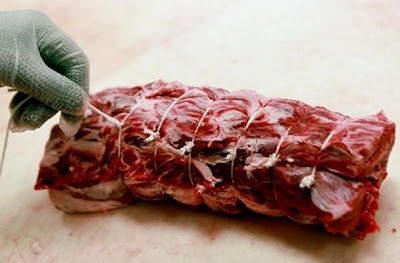 So, tell me: Where do you shop for meat? And how’s the service at your supermarket meat department?